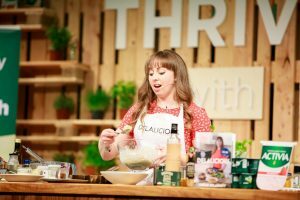 Check out this delish Ginger & Mint Yellow Curry that Sinead Delahunty of Delalicious whipped up for us at Thrive Festival! It is seriously one of the easiest dinners you can make, can be made a million different ways and always results in leftovers for the freezer or for later in the week – I do love a good batch-cook! Switch up the vegetables depending on what is in season or what’s in your fridge. Any root vegetable instead of the carrots will work perfect and broccoli, spinach, green beans or even sprouts instead of the courgette could be used. I would suggest adding any leafy green vegetables just before serving to keep their texture. Of course any kind of beans can be used to replace the butter beans. Heat the oil in a large saucepan over medium heat. Add the onions, garlic and ginger and cut until soft through. Add the spices and salt and stir together until fragrant. Pour in the coconut milk and stock with the mint, stir to combine and bring to a gentle simmer. Cover and remove from the heat. Steam the carrots and courgette until just soft through. Return the curry sauce to the heat, add the steamed carrots and courgette followed by the butter beans. Heat through and serve with your preferred grain or steamed green leafy vegetables.